Names like DuSable, Marquette, and Joliet are cited in the history books. But it was Native Americans who first set the foundation for Chicago to develop into a major Midwestern metropolis. 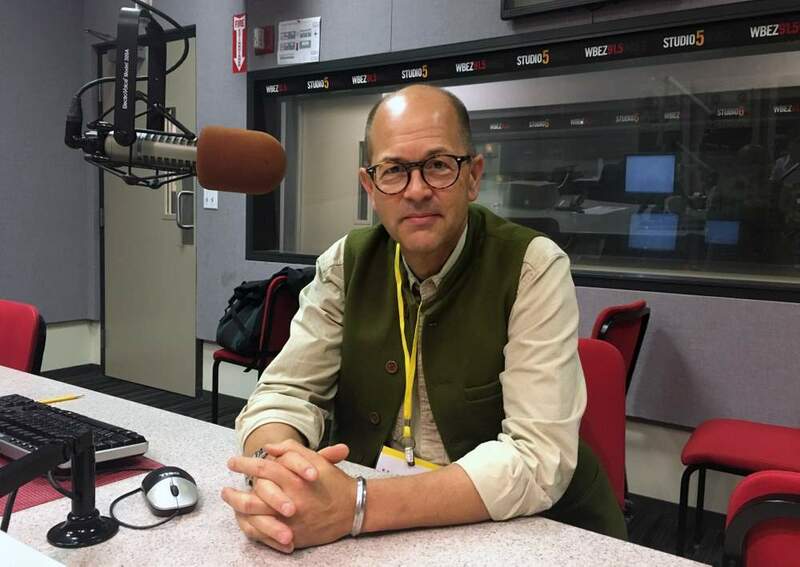 Mark Liechty often finds himself wondering what Chicago was like hundreds of years ago, before the city was officially incorporated in 1837, when thousands of Native Americans were living in villages throughout the region. “One of the ways I try to relate to the place I’m living is to try to understand what it was like in the past,” he says. 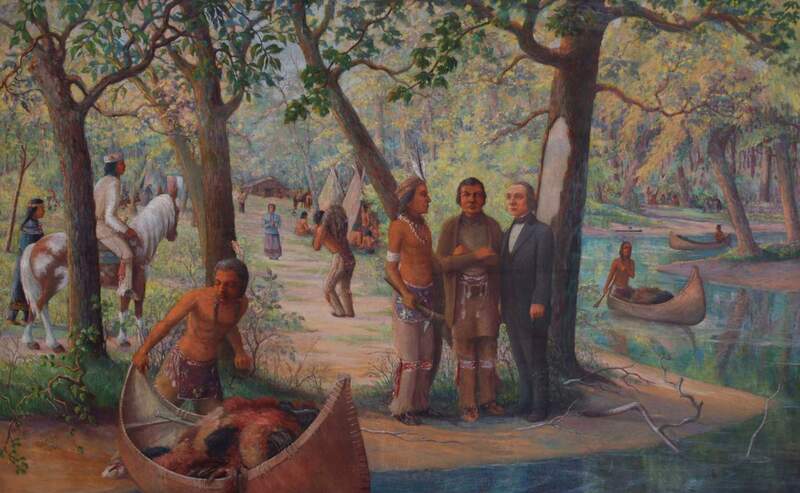 What impact have the region's Native Americans had on Chicago? Mark is asking the kind of question that could easily occupy a historian for a lifetime. There are many ways to answer it. Lots of places in the region take their names from Native American words: Washtenaw, Skokie, Wabash, and of course, Chicago. An estimated 65,000 people of Native American heritage live in and around Chicago today, and are involved in city life. But Mark is most interested in the Native Americans who were living in the region before they were pressured or forced to leave in 1833 after signing a series of treaties with the U.S. government. So we’re going to explore how Native Americans used trade, intermarriage, and their knowledge of the region’s geography to help lay the foundation for the city of Chicago. And we’ll consider an even bigger question: Would Chicago exist as we know it today — as a key Midwestern metropolis — without the Native Americans? Europeans first explored the Chicago region in 1673, and by that time, Native Americans had long been settled in villages around the area. They had established a vast network of trails and portages, or places to carry and drag boats from one water system to another. Chicago was one of the best places to portage between two great water systems: the Mississippi River and the Great Lakes. The two water systems were only separated by a small ridge that [is/was] located in today’s Little Village neighborhood near 31st Street and Kedzie Avenue. 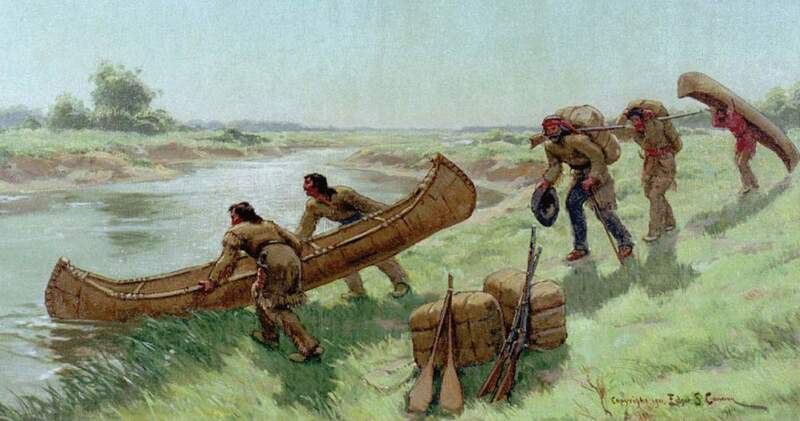 By carrying boats a short distance over the ridge, Native Americans could in theory paddle to the St. Lawrence River or Allegheny River in the east, or to the Gulf of Mexico to the south or to the foothills of the Rocky Mountains in the west. These routes used by the Native Americans became essential to the early European traders and American settlers. “(Europeans) could not have got to Chicago without Indian trails,” says historian Susan Sleeper-Smith. You might expect those trails to be long gone, but many eventually became important city streets. 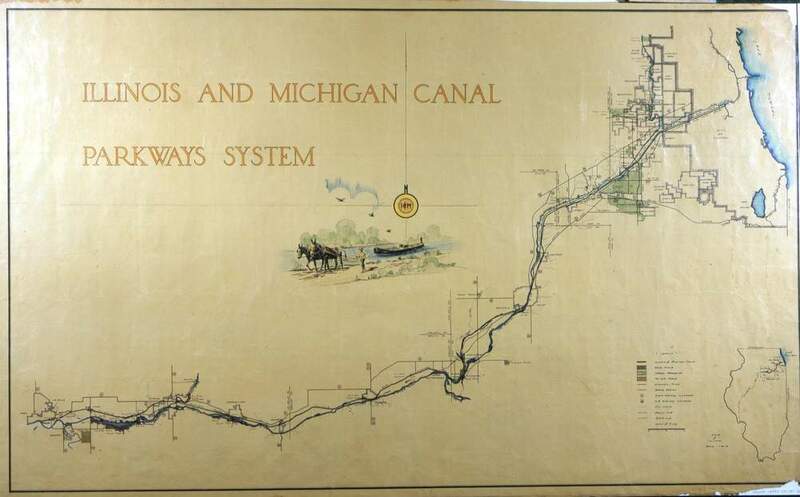 In 1833, the Illinois and Michigan Canal Commission sponsored the first plat of Chicago, a plan that established most of Chicago’s (and many suburban) street grids. 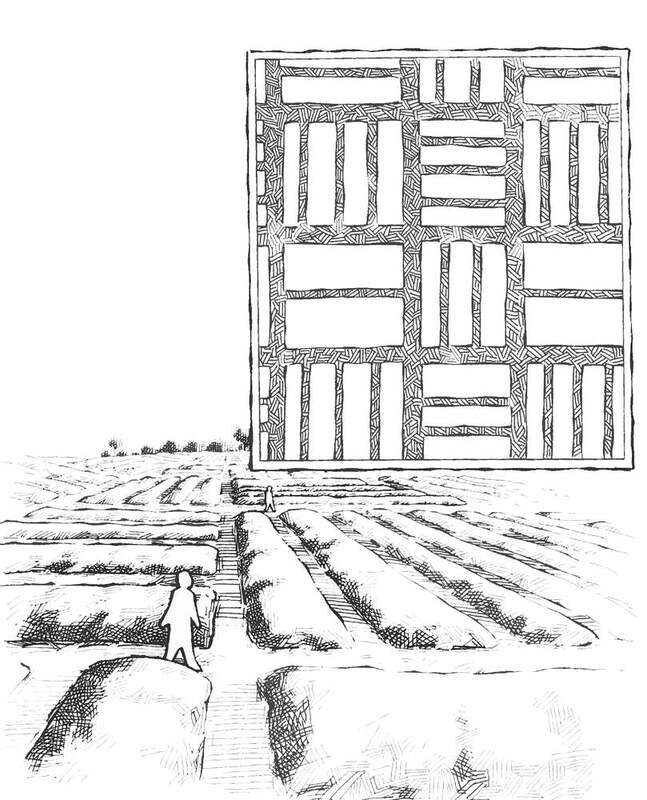 But the grid plan made exceptions for important Native American trails that were diagonal and didn’t fit neatly into the grid. Those trails are now known as Ogden Street, Milwaukee Avenue, parts of Grand Avenue, and Vincennes Avenue. Sleeper-Smith says other Native American routes stuck around in another way. 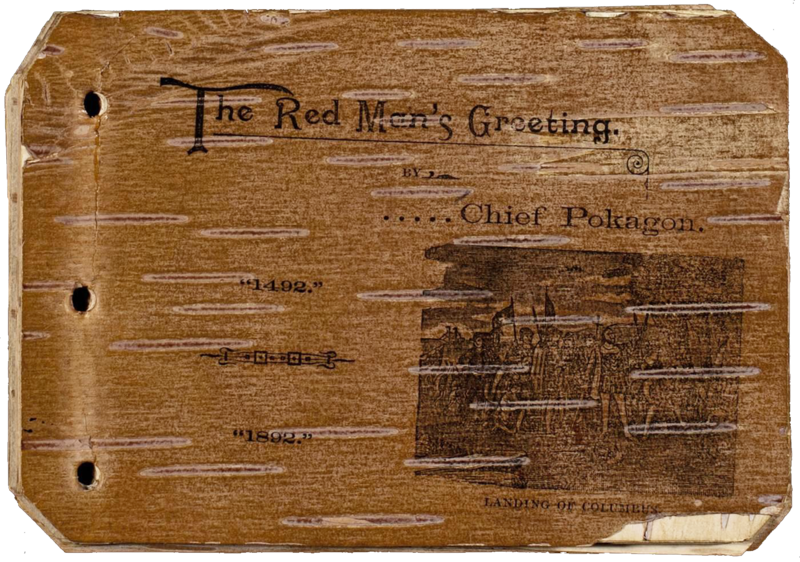 The Potawatomi and other Algonquian tribes were quite tolerant and welcoming to people outside their tribe, assuming the outsiders’ intentions were peaceful, says historian John Low. 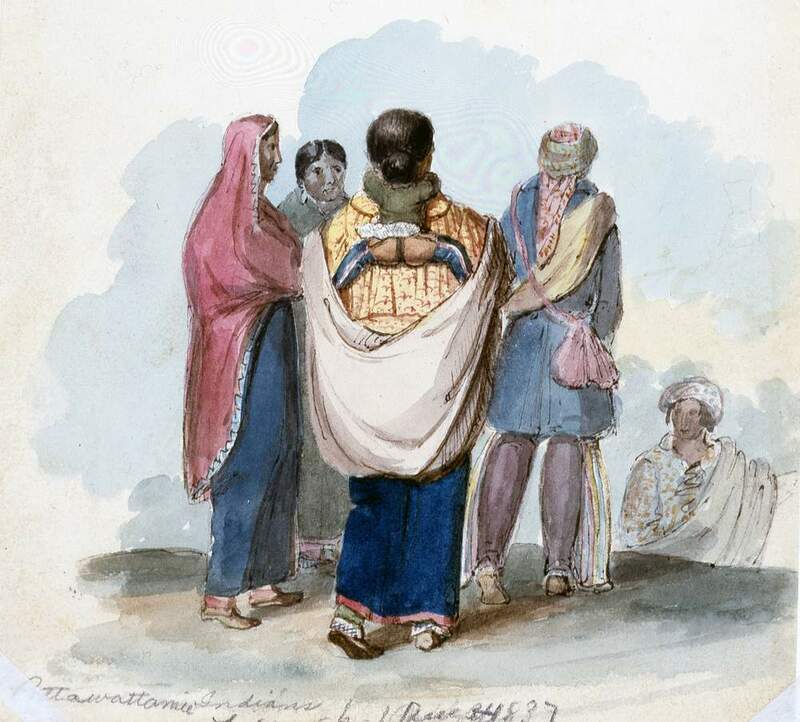 They used intermarriage with other tribes as a way of establishing strong trading alliances in the Chicago region and beyond, a practice early Americans and Europeans later adopted. Before European traders came to the region to trade for furs, Native Americans had established trading networks, alliances, and relationships that allowed for peaceful and beneficial trade. Native Americans trusted their trading partners because they knew them, Sleeper-Smith says. “Indigenous societies trade with kin; they do not trade with strangers,” she says. Algonquian Indians frequently intermarried between tribes, which allowed two kinship networks to create a new trading relationship. 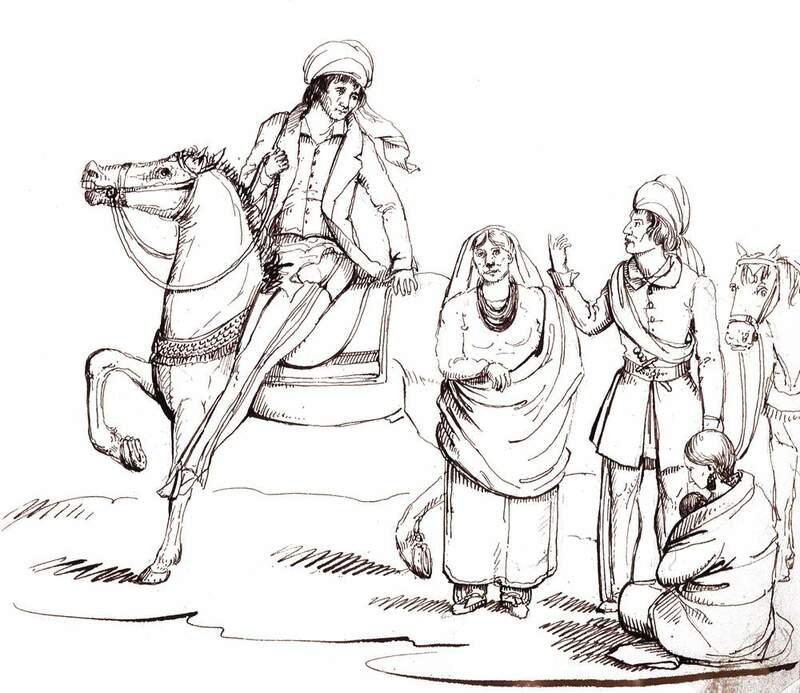 Sleeper-Smith says the Europeans traders who came to the region in the late-18th century quickly recognized the value of intermarrying with Native Americans. 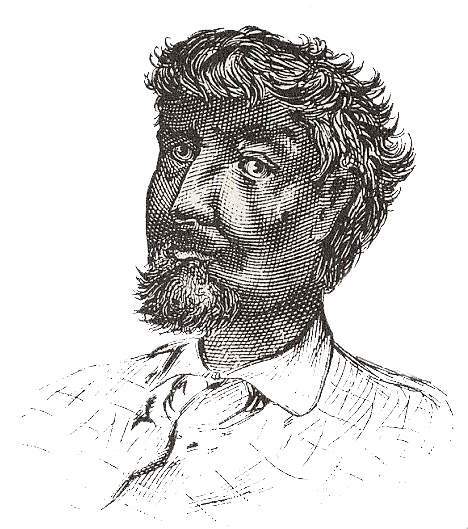 Chicago’s first permanent settler, Jean Baptiste Point DuSable, an African-Frenchman, married a Native American woman (thought to be Potawatomi). Sleeper-Smith says DuSable’s wife was crucial to his succes. She helped translate for him and gave him access to a wide network for trading. DuSable’s wife was baptized as “Catherine” and some accounts name her as Kitihawa. Their relationship brought status and profit for both of them. Still, Sleeper-Smith says the marriage was not simply a business relationship: They lived together for 30 years and had at least two children. 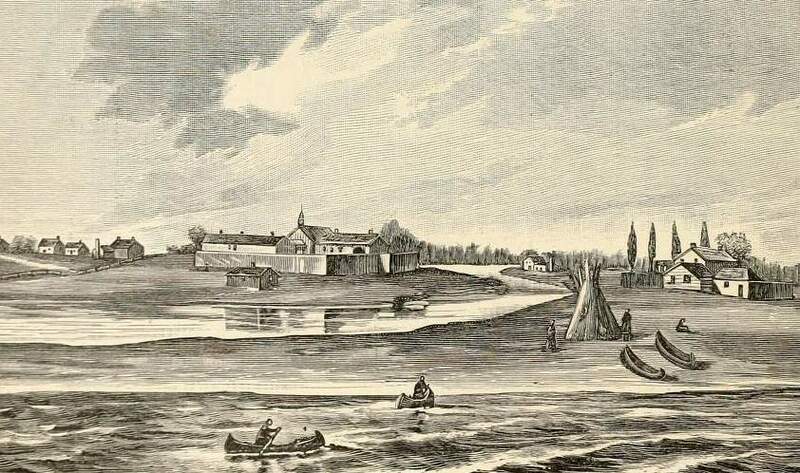 In the years between 1790 and 1830, traders and farmers established a small trading community at the mouth of the Chicago River that grew into a town and then a city. Many of those traders, including fur trader Antoine Ouilmette, similarly married Native American women and raised multi-ethnic families. 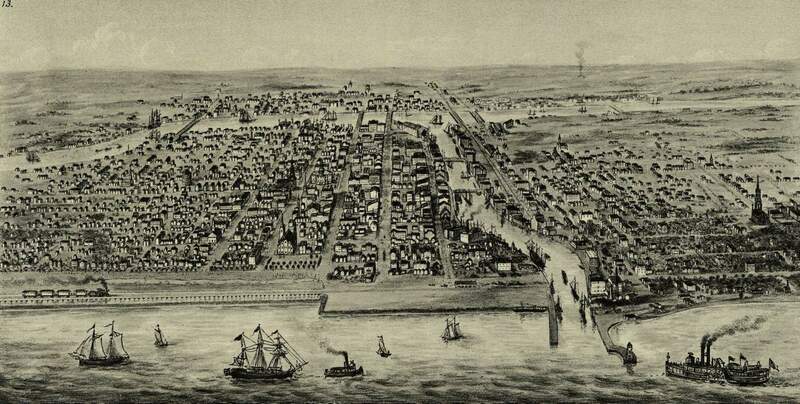 The earliest version of Chicago as a settlement was established by Native Americans alongside Europeans and Americans. Chicago’s early popularity as a destination for settlement was due in part to it’s reputation as a good place to make a go as a farmer. “One of the reasons (Americans) know it’s good farmland is there are people farming this land when they come through it. There are Native American women who are very successfully farming this land and raising a surplus, and doing so with relative ease,” says Ann Durkin Keating, a historian who studies how Chicago transitioned from a tiny, multi-ethnic trading settlement to a vast industrial city during the 1800s. Wheat, corn, and other grains were among the first commodities traded in Chicago, a legacy that lasts to this day, as Chicago is still home to the largest agriculture commodity exchange in the world. And even though Native American women had been successfully farming the land for years, there’s an often repeated idea in many history books that the agricultural potential of the prairie around Chicago was “locked” until 1837. That’s when blacksmith John Deere famously invented a polished steel plow, which according to many accounts, finally allowed settlers to realize the potential of the rich soil under the dense prairie vegetation. 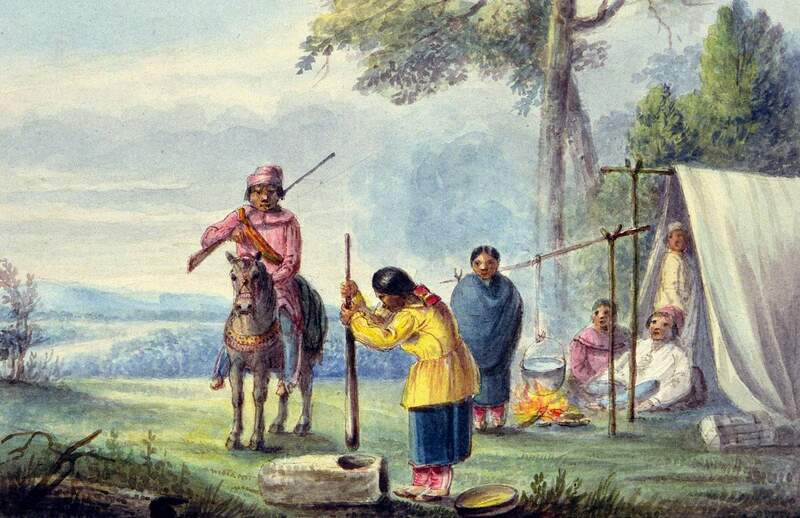 Keating says the “unlocking” trope suggests before the 1830s, Native Americans in the Chicago region lived in a wilderness whose potential they did not fully understand, and therefore, did not fully deserve to own. John Deere’s plow was certainly a very important invention. It allowed farmers to cultivate more acres quickly, but the richness of the prairie soil was long understood by the Potawatomi. 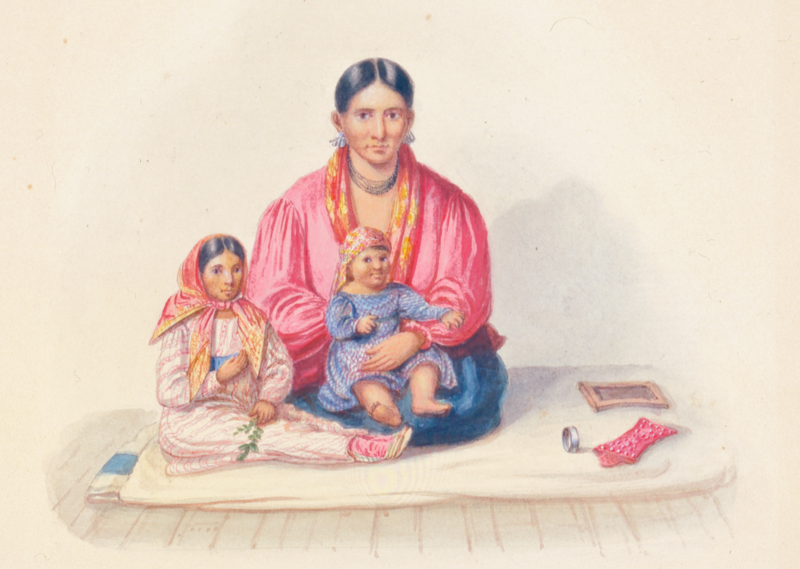 Records from the 1700s show that Potawatomi women grew surpluses of wheat and corn that they used to feed their families and sell to traders, missionaries, and military installations. The Potawatomi farming was not simple or primitive, says Keating. 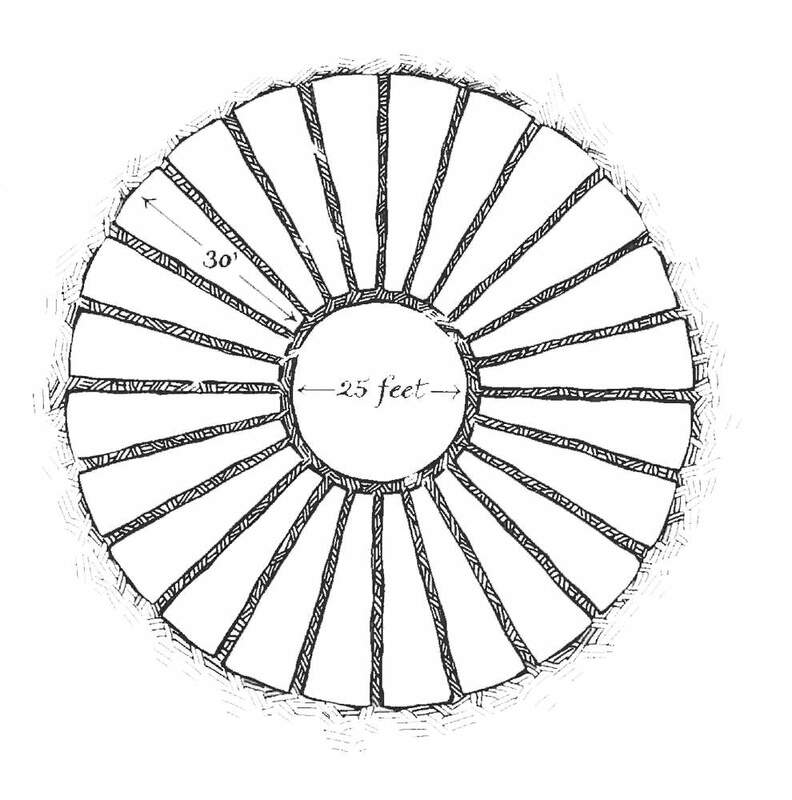 By the late 1700s, they were trading furs for lightweight French plows, which they used to cultivate and clear plots that were hundreds of feet long. American settlers weren’t merely inspired by the successes of Potawatomi agriculture, according to Sleeper-Smith. The site for a Midwestern metropolis? By 1833, most Native Americans were displaced from the region after they were pressured to sign a series of coercive treaties. 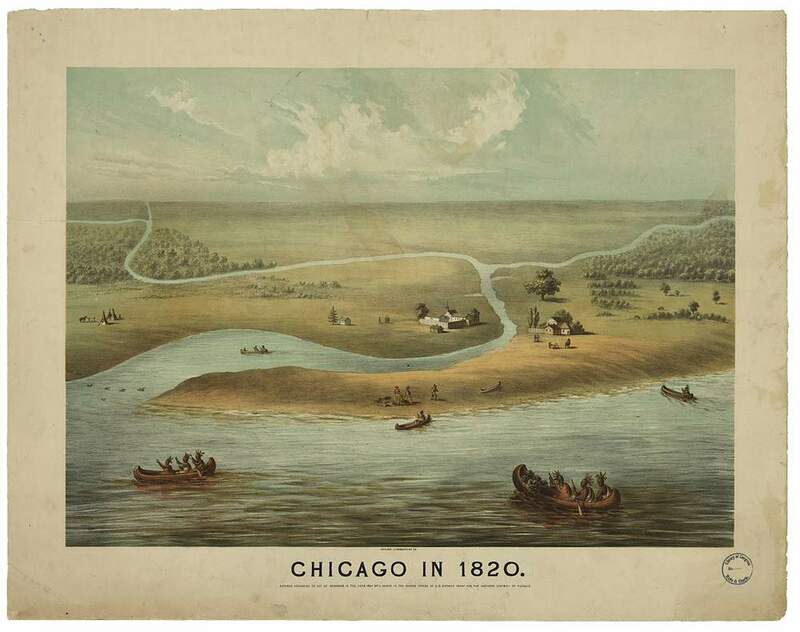 But the role they played in establishing Chicago as a trading and agriculture center suggest a broader idea: It’s possible the greatest impact Native Americans had on Chicago is the creation of modern day Chicago as the nation’s third largest city, the capital of the Midwest, and a major economic and industrial center. It was the Native Americans who first taught Europeans and Americans how to benefit from the region. They showed settlers the agricultural potential and the important trails between early settlements. And, most importantly, they revealed the value of the Chicago portage. 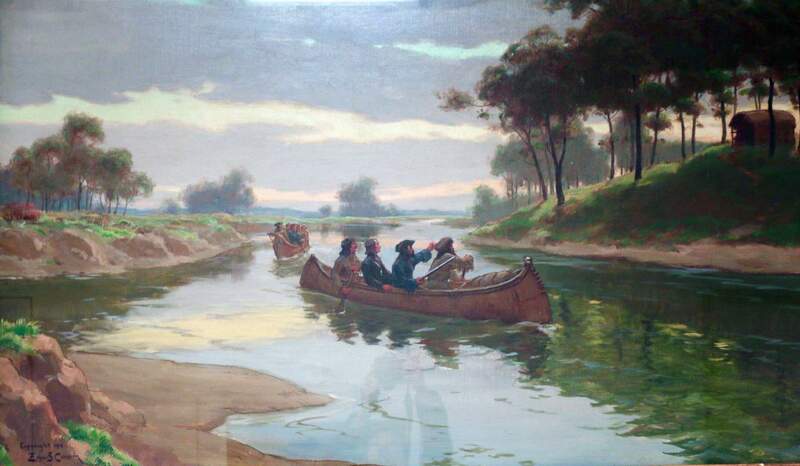 In 1673, Native Americans told French explorers Jacques Marquette and Louis Joliet about a great place to portage from the Des Plaines River to the Chicago River, which was a shortcut back to their starting point in Wisconsin. Marquette and Joliet are memorialized as foundational to Chicago, says historian Ann Durkin Keating. So why not include the people who showed them the route? 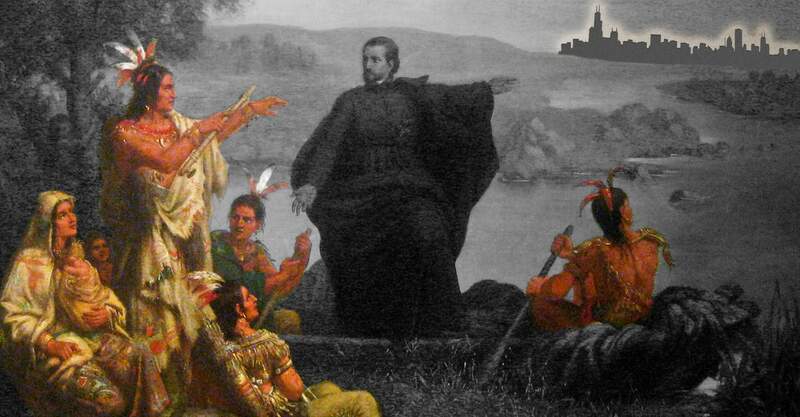 The knowledge the Native Americans had of Chicago’s geography was essential to the French, English, and Americans who settled and traded in the region years later. The village of Chicago was co-founded by DuSable and his wife, Catherine — a Native American woman — who helped him take advantage of Chicago’s vast trade networks. Others followed. 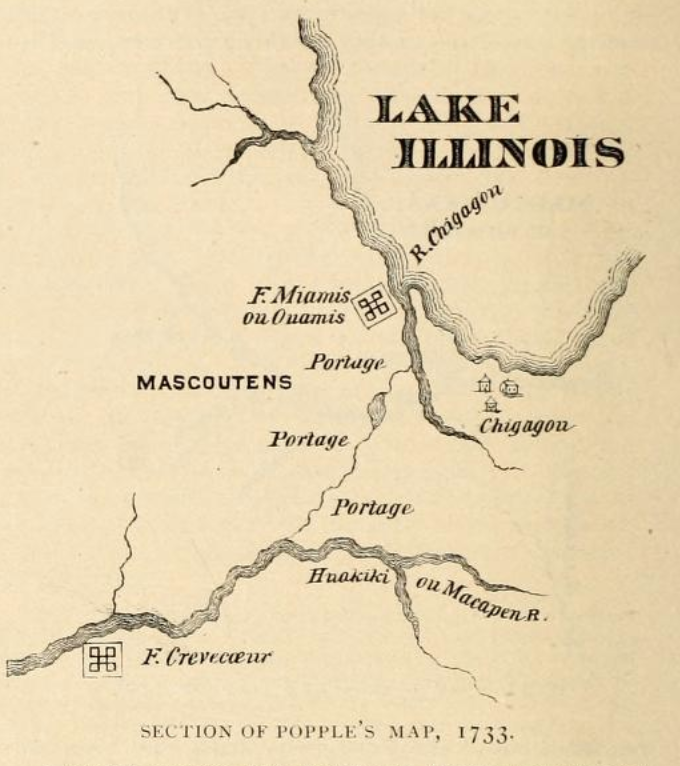 When the Illinois and Michigan Canal Commission began planning a canal in 1830, they did so based on their knowledge of Chicago’s geography. 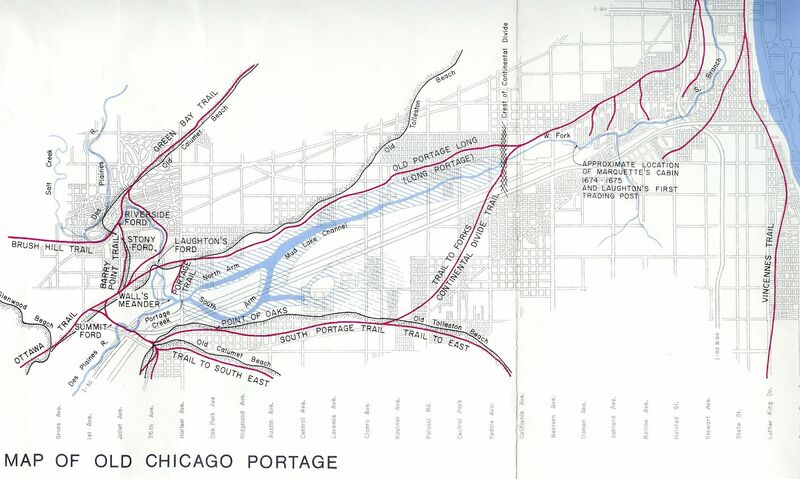 The canal was planned in the ’30s, built in the ’40s, and essentially replaced the Chicago portage. It was the only dominant form of transportation for about a decade, but during that time, it attracted investment and infrastructure to the city. 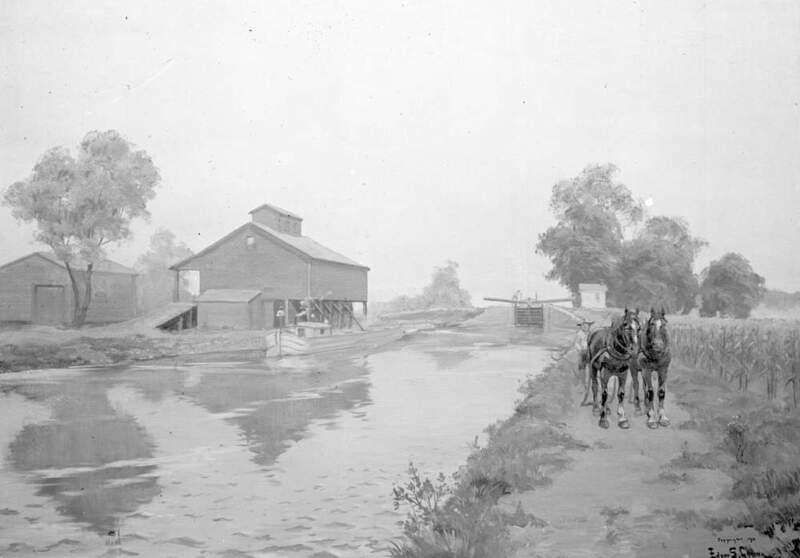 Many scholars have argued the canal was an essential forerunner to Chicago becoming a railroad hub in the 1870s. During most of the 1800s, there was a race to see which Midwestern city would become the great Midwestern metropolis. St. Louis, Cincinnati, and Milwaukee were all candidates at one point. Scholars agree that Chicago won that race because it became a railroad hub, the locus point of eastern and western railroads, and the most important trading city in the west. 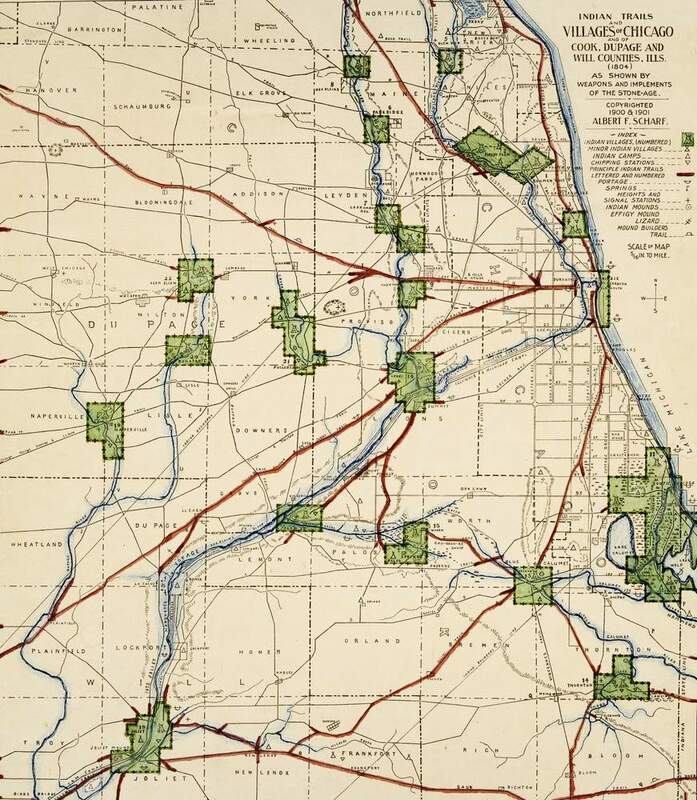 But Chicago may not have become the first major railroad hub without the head start offered by the canal. So if the Native Americans planted the idea for the canal, and the canal made the railroad possible, and the railroad cemented Chicago’s status as the great Midwestern metropolis, that suggests the contributions of Native Americans was essential to Chicago’s becoming a great Midwestern metropolis. In 1833, the Treaty of Chicago stipulated members of the Potawatomi, Odawa, and Ojibwe nations living in the Chicago area would have to leave. In addition to cash payments for the land, they were also promised land east of the Mississippi River or in northern Wisconsin and Michigan’s Upper Peninsula. But not all Native Americans left. John Low’s people, the Pokagon Band of the Potawatomi, negotiated the right to remain in the area due to their prior conversion to Catholicism, Low says. The ensuing attention led the fair organizers to invite Simon Pokagon to speak at “Chicago Day” at the fair, in front of 70,000 people. Mark Liechty grew up in Northern Indiana, and he remembers seeing roads named after the Pokagon Band of Potawatomi in the region. 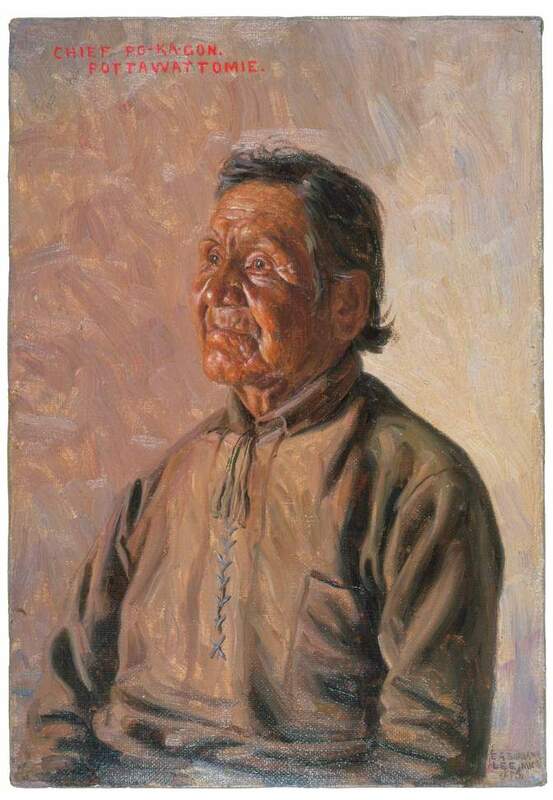 He was fascinated to learn about Simon Pokagon at the Columbian Exposition, as well as the importance of Native American women, like Catherine DuSable, to the creation of Chicago. Sleeper Smith, Susan et al, Editors Why You Can’t Teach United States History Without American Indians University of North Carolina Press, 2015. Full-screen photos courtesy of Wilhelm Lamprecht, A.T. Andreas, James Iska, Tippecanoe County Historical Society, and Chicago History Museum (DN-0009355 - Cameron painting of Indian camp and DN-0009359 - Marquette and Joliet painting that was removed).